By olduvai in Energy, Environment on March 15, 2018 . 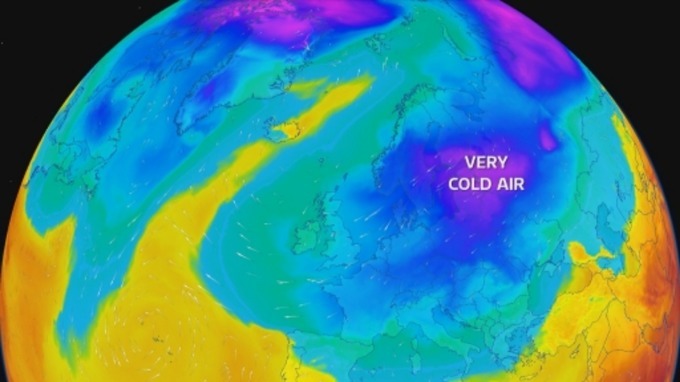 From 26th February to 5th March 2018, the UK and indeed most of Northern Europe was gripped by severe cold weather blowing in from Siberia. The event was Christened the Beast From the East by UK press. The conditions were harsh, not just sub-zero temperatures and snow but high winds that created life-threatening conditions. In this post I present the electricity generating statistics for the month 13 February to 12 March. The key point I want to make is that during the week of The Beast the UK’s remaining 10.6 GW of coal ran flat out day and night for 8 days. I think the time has come for the UK Government and National Grid to explain how they plan to keep the lights on when they close down this coal capacity by 2022-2025. Before looking at the electricity data I want to dwell on the cause of The Beast which comes down to a process called Sudden Stratospheric Warming. This UK Met Office link has this to say (note there is also a good vid). Jet streams high up in our atmosphere, in both the northern and southern hemisphere, circumnavigate the Earth from west to east. One of these, the Polar Night Jet, circles the Arctic. Sometimes the usual westerly flow can be disrupted by natural weather patterns or disturbances in the lower part of the atmosphere, such as a large area of high pressure in the northern hemisphere. This causes the Polar Jet to wobble and these wobbles, or waves, break just like waves on the beach. When they break they can be strong enough to weaken or even reverse the westerly winds and swing them to easterlies. As this happens, air in the stratosphere starts to collapse in to the polar cap and compress. As it compresses it warms, hence the stratospheric warming. This is the official view that needs to be contrasted with the man-made climate change drivel emanating from factions of the climate change community.